As its name suggests, the seven chimneys on the roof of the Renaissance-style House of the Seven Chimneys (Casa de las Siete Chimeneas) stand out on the edge of the Plaza del Rey. Nowadays, the building houses the Ministry of Culture, but it has a murky history, and is considered to be haunted. One of the few 16th century buildings remaining in Madrid, it was designed by the architect Antonio Silero and finished in 1577. 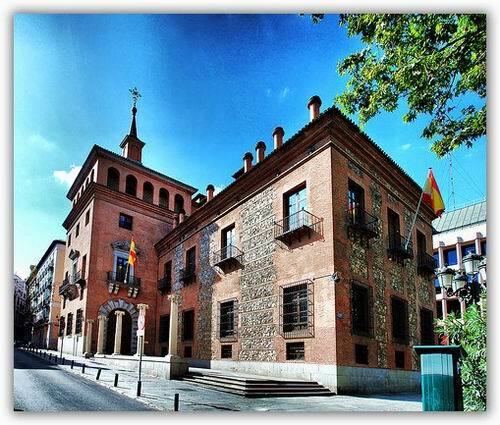 In 1583 it was acquired by a Genovese merchant, Baltasar Cattaneo, and was popularly known as the Casas de Cataño. A few years later, Cattaneo commissioned the architect Andrea de Lurano to extend the building, and it was at this point that the famous seven chimneys were added. Ghosts are said to walk its roof on moonlit nights, which might be explained by a variety of legends. One story alleges that King Felipe II had the house built to contain an illegitimate daughter, who lost her mind. Another version suggests that the seven chimneys represent the seven cardinal sins. Its most famous tale, though, is of a lover of King Felipe II who became a nuisance to him when he married his fourth wife. He locked her in the House of the Seven Chimneys, but she escaped, and threatened to marry an old man to make the King jealous. When the King responded with enthusiasm to his invitation to the wedding, and even offered to be best man, the woman became so distraught that she allegedly stabbed herself in the heart after the wedding in the cellar of the house. Her ghost is said to be seen on the roof on bright moonlit nights, looking towards the Royal Palace. Legend? Perhaps. In the 19th century, though, when builders were making changes to the building for the Bank of Castille, they came across a woman's skeleton in the cellar with a dagger in the heart. The skeleton dated from the 16th century, and was found with several coins of the period. There are alternative explanations, of course. A woman allegedly died of a broken heart when her husband was killed in the Battle of San Quintin, and her father buried her body in the walls of the house, hanging himself days later. A viable alternative for the rejected lover story? Almost. When the building was renovated again in 1960, a man's skeleton was found buried in the walls. Over the years, the building has had a number of illustrious visitors, including Charles I of England. The house is situated in the historic Chueca area of Madrid, which can be reached by taking bus 1, 9, 74, 146 or 150. The nearest Metro station is Banco de España.